Well, here it is All Hallows' Eve and the weather sure doesn't feel like Halloween is tomorrow. At least those little ghosts and goblins wont be getting rained on. I'd also like to remind you all that tomorrow you can bring your little trick or treater by here and I'll be passing out candy. And starting Thursday Nov 1st we will begin our 2nd Annual Marine Toys For Tots toy drive, so look for the giant decorated box at our customer counter and please donate a new, unwrapped toy or sports equiment to be given to needy children this Christmas. We will also be holding a food drive to help provide food to needy families. As some of you may know, my son-in-law is an active Marine and we are so proud of him, we here at The Speed Shop would like to help support the Marine Toys For Tots Foundation and would be so grateful for your support. Also, just a friendly reminder, be sure to change your clocks and FALL BACK on November 4 for Daylight Savings Time. Now, let's take a look at some of the shows that we have coming up in November. On Sunday Nov 4 is the OldSkool 66 Cruzers Classic Car Show featuring the Spark of Love Toy Drive at Upland Memorial Park from 10am-2pm. A donation of $10 plus an unwrapped toy is asked for this show. The show is open to all Cars, Trucks, Boats and Motorcycles (if it rolls it will be there), also the Upland Firefighters Association will be cooking hamburgers, and you know those firefighters can cook. On Wednesday Nov 7 is the Twilight Cruise at the NHRA Museum in Pomona from 4pm-8pm. The show is open to all 1970 and earlier rods, customs, classics, and muscle, admission to the show is free, and all in attendance may visit the Museum at no charge. The cruises feature the Celebrity Picks, great raffle prizes and a huge 50/50 drawing. Vehicles chosen by our celebrity selectors win the opportunity to parade down the Auto Club Pomona Raceway on Sunday morning during the Automobile Club of Southern California NHRA Winternationals in February. For more info on the NHRA Museum and their monthly cruise nights you can check out their website at www.museum.nhra.com On Thursday Nov 11 is the 1st Annual United Elite Allstars Car Show at 1933 W Eleventh Street, Upland from 11am-3pm. The show is open to Classics, Hot Rods and Motorcycles and include food and activities for the entire family. I'll also give you a save-the-date for December, this is one of the most popular shows of the entire season. On Sunday December 2 is the 15th Annual John Force Holiday Car Show at the John Force RaceStation, 22722 Old Canal Road in Yorba Linda from 10am-4pm. This show benefits the California Highway Patrol's CHiP's Toy Drive, admission to the show is a new unwrapped toy valued at $10. 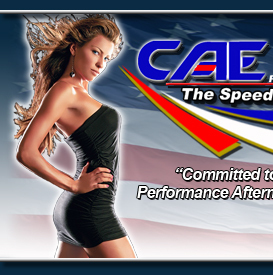 You can see a complete list of shows and events coming in November on our website at www.caeperformance.com Just click on the EVENTS tab. And if you know anyone who would like to start recieving my weekly newsletter, just have them go to our website and on the HOME page just fill in the subscribe box. If you have a show or event coming up that you woiuld like me to include in my newsletter, yo can email me all the details at caeperformance@aol.com You can also check out our FACEBOOK fan page. And be sure to "LIKE" us while you're there. Check out the fun pics that we've got up, I'd like to send out a big THANK YOU to Charyle from Bob's Big Boy in Norco for some of the awesome pics she's sent, I've got more to post from their Halloween car show last weekend. I want to wish you all lots of Treats tomorrow night and I hope you don't get any Tricks played on you. I forgot to mention a very special event happening this weekend so I'm sending out this special announcement. On Saturday Nov 3 the city of La Verne, next to Auto Club Raceway at Pomona, will host a FREE Fan Fest from 10 am-3 pm prior to the season-ending Automobile Club of Southern California NHRA Finals. The Fanfest will take place in Old Towne La Verne, located at the intersection of D Street and 3rd street. NHRA Funny Car points leader Jack Beckman, and fellow drivers John and Courtney Force and Jeff Arend will be at the event for an autograph session, and race cars — including Robert Hight’s Auto Club Mustang display car and nostalgic front-engine dragsters — will line the city streets in a dazzling display of horsepower and chrome. The band The Ravelers will entertain fans. So it's not too late to plan this into your weekend.